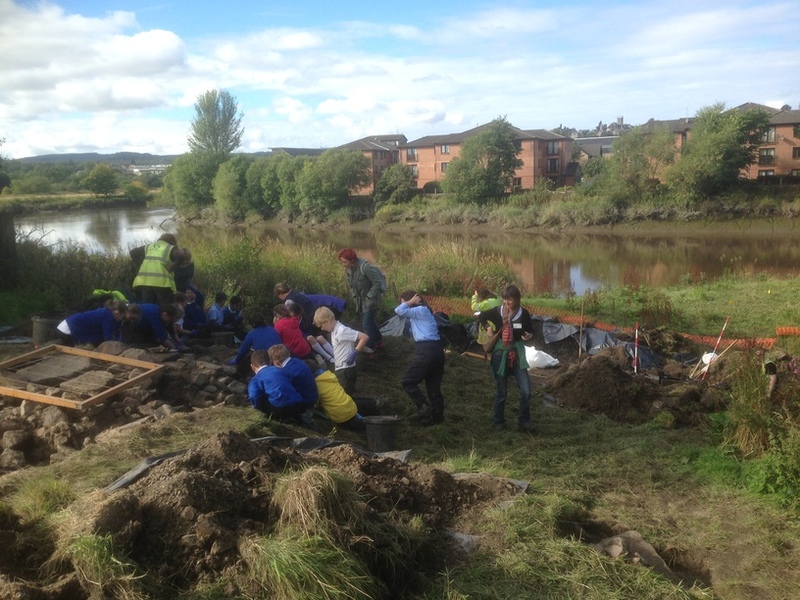 Over two weeks in September, the Cambuskenneth Harbours project brought together a wide range of experts and local volunteers to investigate the medieval harbour of Cambuskenneth Abbey, which lies on the River Forth near Stirling. Founded by the Scottish king David I in around 1140, Cambuskenneth Abbey had a strong influence on the development of medieval Stirling. During the excavations, which were led by GUARD Archaeologist, Warren Bailie, a large portion of the medieval harbour was discovered. Medieval pottery sherds from the twelfth to the sixteenth centuries were recovered from the base of the harbour, which comprised of a stepped dry-stone harbour feature bedded into the clay of the river bank. The steps of the harbour enabled boats to offload their cargo at varying water levels. Interestingly the water level during the harbour’s use must have been higher than mean levels today, so the project has therefore not just enhanced our understanding of the wider medieval archaeology at Cambuskenneth but has also provided evidence of mean water level change at Stirling since the medieval period. A metal-detecting survey was also undertaken separately by metal detectorists from the Scottish Artefact Recovery Group on the Abbot’s Ford to the east of Cambuskenneth. This fording point is directly in line with the medieval road known to have led east beyond the banks of the Forth onto the Bishop’s Palace at Throsk in the medieval period. A coin of Robert II (reigned 1371-1390) was recovered during this survey, along with a medieval horseshoe fragment and possible lead fishing net weights. This exciting project revealed an extremely rare example of a surviving medieval harbour and crossing points. The harbour and ford are primitive in design but functional for several centuries in serving Cambuskenneth Abbey and the communities on what was effectively a holm (an island created by river) within the Carse landscape. The excavations have offered a glimpse of medieval life surviving on the edge of the Forth. Most other river systems across Scotland and elsewhere have long since evolved in adaption to the industrial revolution but Cambuskenneth has evaded such destruction. GUARD Archaeology were commissioned as part of the Inner Forth Landscape Initiative (IFLI) and on behalf of Stirling Council by Dr. Murray Cook to go back and investigate the medieval harbours, piers and fording points around Cambuskenneth Abbey. This project is one of 50 around the Inner Forth, and has been made possible thanks to funding from the National Lottery through the Heritage Lottery Fund. The dig at Cambuskenneth Watergate feeds into another IFLI project, Forth Crossings, which aims to investigate historic trade along the Inner Forth. The project coincided with Doors Open Day, The Inner Forth Festival and the Scottish Archaeology and Heritage Festival 2015 to achieve maximum levels of participation. As well as archaeologists from GUARD Archaeology and metal detectorists, archaeologists from Archaeology Scotland, historians and environmental specialists from Stirling University, school pupils from St Modan’s, St Ninian’s and Riverside Primary Schools, students from the Scottish Agricultural College and members of the local and wider community participated in the archaeological investigations at Cambuskenneth. In total, 196 volunteers, 280 school children and 24 college students participated in the investigations, with 150 visitors to the site during Doors Open Day.